Severe (sometimes fatal) blood/bone marrow problems (such as low red/white blood cells and platelets) and liver problems have occurred with felbamate. 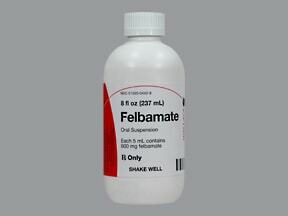 Felbamate should be used only by people with severe seizures (epilepsy) that cannot be controlled with other medications. Do not use this drug if you have liver problems. Discuss the risks and benefits with your doctor before starting felbamate. Tell your doctor right away if you have signs of infection (such as sore throat that doesn't go away, fever, chills), signs of anemia (such as unusual tiredness), easy bruising/bleeding, or signs of liver problems (such as nausea/vomiting that doesn't stop, stomach/abdominal pain, yellowing eyes/skin, dark urine). Usually, people who have liver problems while taking this drug should not start taking it again. Your doctor will check certain blood tests (liver function, complete blood count) and may have you see a doctor who treats blood/bone marrow problems before you start felbamate and while you use this drug. Blood/bone marrow problems may also occur after you stop taking the drug. Blood tests may be needed for some time after you stop taking felbamate. Keep all medical and lab appointments. Who should not take Felbamate? Read and sign the Informed Consent form provided by your doctor. Read the Medication Guide provided by your pharmacist before you start taking felbamate and each time you get a refill. If you have any questions, ask your doctor or pharmacist before starting felbamate. Take this medication by mouth with or without food as directed by your doctor, usually 3 to 4 times a day. Take with food or milk if stomach upset occurs. The dosage is based on your medical condition and response to treatment. For children, the dosage is also based on weight. To reduce your risk of side effects, your doctor may direct you to start this medication at a low dose and gradually increase your dose. Do not stop taking this medication without consulting your doctor. Seizures may become worse when this drug is suddenly stopped. Your dose may need to be gradually decreased. If you are already taking other anti-seizure medications, carefully follow your doctor's directions for adjusting the dose of these other medications when you start taking felbamate. 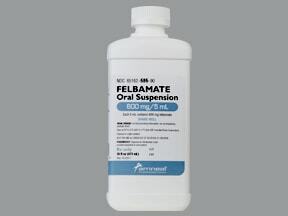 What conditions does Felbamate treat? Drowsiness, dizziness, nausea, vomiting, diarrhea, constipation, trouble sleeping, loss of coordination, headache, blurred/double vision, hiccups, or loss of appetite may occur. If any of these effects last or get worse, tell your doctor or pharmacist promptly. List Felbamate side effects by likelihood and severity. Before taking felbamate, tell your doctor or pharmacist if you are allergic to it; or to meprobamate; or if you have any other allergies. This product may contain inactive ingredients, which can cause allergic reactions or other problems. Talk to your pharmacist for more details. Before using this medication, tell your doctor or pharmacist your medical history, especially of: blood/bone marrow disorders (such as anemia, bleeding problems, low white blood cell count), liver disease, kidney disease, mental/mood disorders (such as depression, suicidal thoughts). This drug may make you dizzy or drowsy or blur your vision. It may also cause double vision. Alcohol or marijuana can make you more dizzy or drowsy. Do not drive, use machinery, or do anything that needs alertness or clear vision until you can do it safely. Limit alcoholic beverages. Talk to your doctor if you are using marijuana. What should I know regarding pregnancy, nursing and administering Felbamate to children or the elderly? Some products that may interact with this drug include: clopidogrel, orlistat. 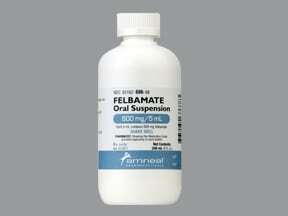 Does Felbamate interact with other medications? Lab and/or medical tests (such as complete blood count, kidney/liver tests) should be done before, during, and after treatment with this medication. See also Warning section. 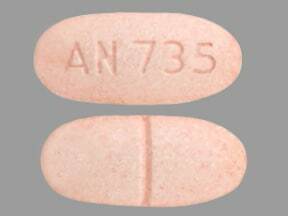 This medicine is a peach, oval, scored, tablet imprinted with "AN 735". 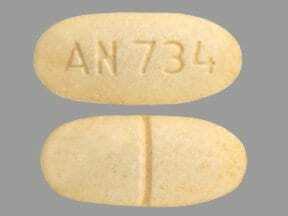 This medicine is a yellow, oval, scored, tablet imprinted with "AN 734". This medicine is a yellow, oblong, scored, tablet imprinted with "WP 0320". 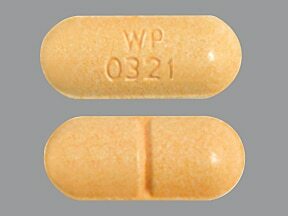 This medicine is a peach, oblong, scored, tablet imprinted with "WP 0321". Are you considering switching to Felbamate? How long have you been taking Felbamate?